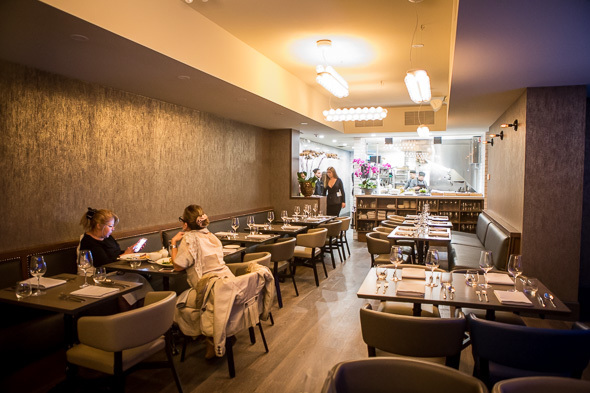 Entice is a culinary lounge on West Queen West with grand ambitions. 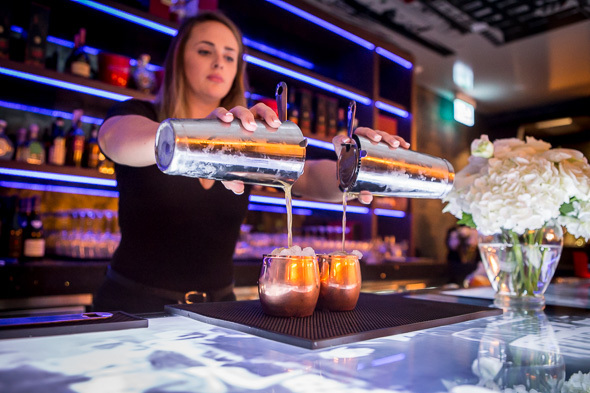 It's a restaurant with a supper club kind of vibe that aims to be an immersive experience where sights, sounds and tastes are all accentuated. It is indeed a visually enticing restaurant. The swank dining room looks like big money and key features include a bar top made of TV screens, textured walls and even touchless (sensor-enabled) powder rooms. To drink there are ten classic cocktails plus three "molecular drinks" which change seasonally. 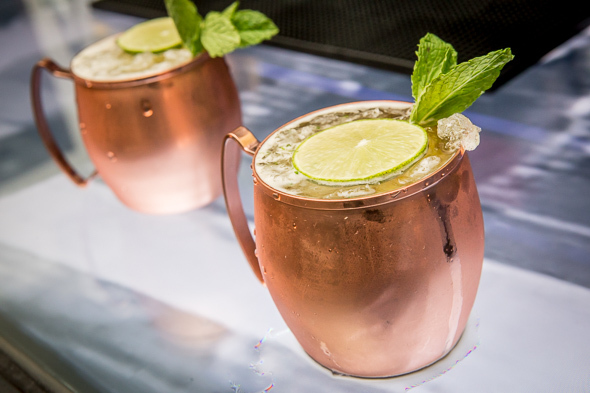 They're pricey; the Cucumber Granita is $18, but the combo of vodka with cucumber juice and black pepper syrup is delightfully spun into a frozen slushie state with liquid nitrogen (just note you might miss this dash of theatre unless you're sitting at the bar). 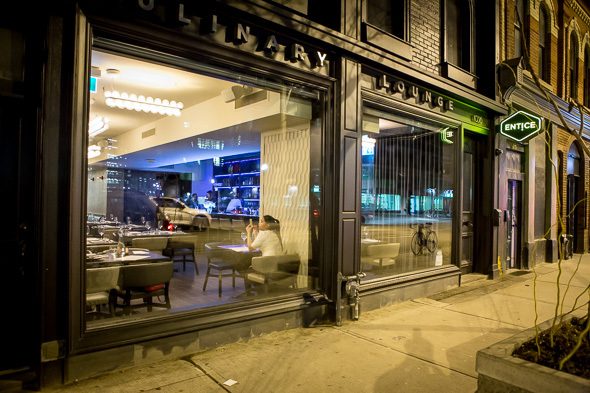 The "global" approach to the menu from chef Ryan Wilson-Lall (former chef de cuisine at Frank ) employs a liberal dose of molecular gastronomy. 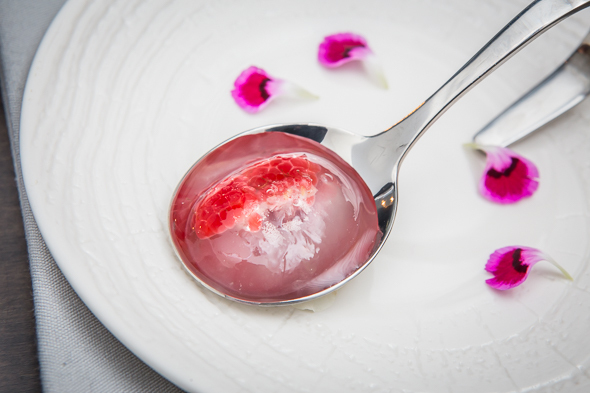 We're off to a good start with the surprise amuse bouche; a bubble of coconut water with raspberries that burst in my mouth. 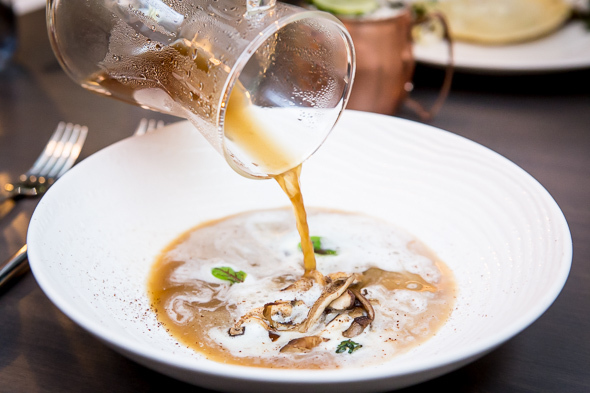 Then there's the mushroom moccachino ($10), a soup that bills itself as a wild mushroom espresso broth with shaved chocolate and a sweetened froth. It's brewed in a hot infusion siphon which is a cool hack for making a perfectly clear consume, but the combination of flavours is...perplexing. The carbonara raviolo ($16) is redeeming, the house-made pasta forms a pocket around a roasted garlic mascarpone and egg yolk and it's a delight to cut into. 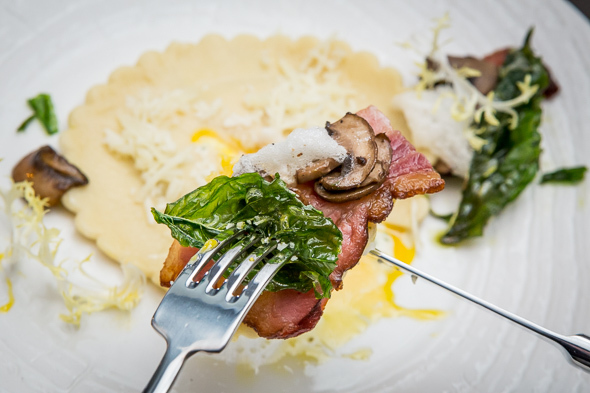 It's smothered in pecorino and served with crispy basil, bacon and cremini mushrooms to be reconstructed on the fork as one eats. 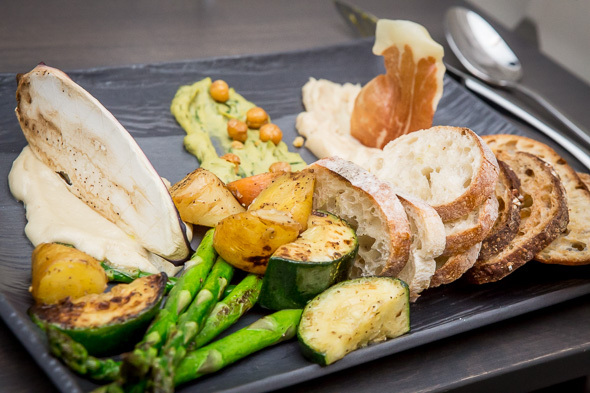 Next up is The Tour ($13) a trio of dips served on a crowded platter of roasted vegetables with bread. It's described on the menu as "moussaka, warm serrano bechamel, roasted garlic and parsley..." only said "moussaka" is more accurately a starchy eggplant-flavoured bechamel sauce. It's devoid of the expected rich tomatoey lamb and it's almost indistinguishable flavour-wise from the accompanying "serrano bechamel". I don't find either bechamel dips very appealing; they kind of jiggle in a congealed state and go almost untouched as we eat around them. I stick to the roasted garlic dip plated in the centre, it's actually quite good, kind of like an ultra-silky hummus. The accompanying roasted vegetables are welcome, although the whole dish is heavy and starchy. 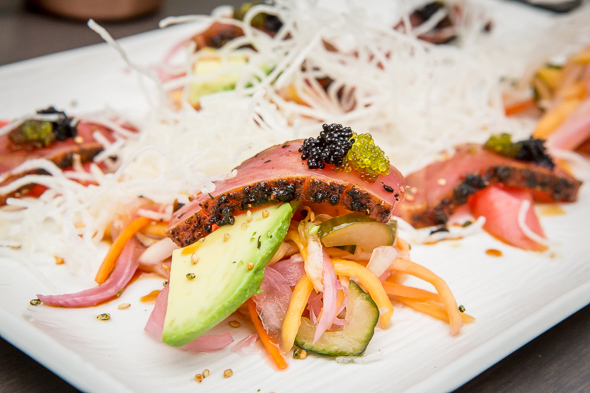 As it's set down on the table the Spicy Ahi Tuna ($25) is described as a "hot mess on a plate" and I can't help but agree. I doubt there's even four ounces of fish on this plate; more prominent are the haphazard mounds of mango, daikon, cucumber and green papaya slaw. Calling this one an entree seems like a stretch. The sour cherry duck breast ($28) makes a good first impression but on closer inspection the skin is browned but not rendered. What would usually be the best part is almost inedible (save for a few slices on the ends). 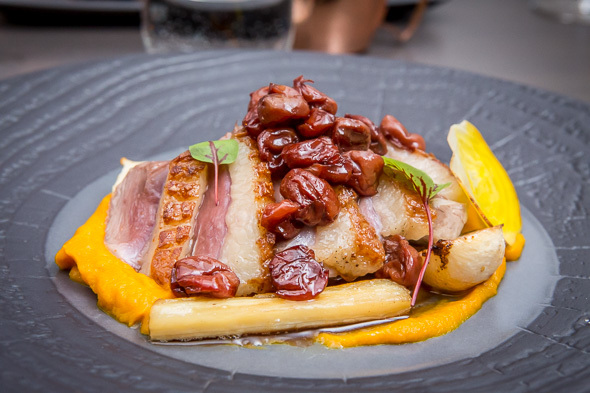 The dish includes compressed pears, carrot puree, tangy cherry sauce which amounts to sweet on sweet on sweet and it's missing salt and acid. 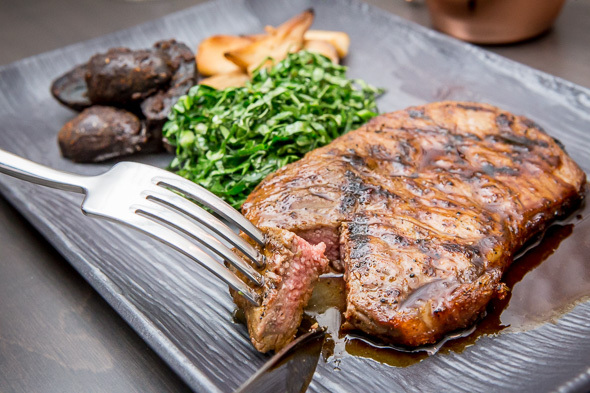 The striploin ($29) fares better and features a nicely seared steak boasting a rosy centre. It's plated alongside a chiffonade of aggressively seasoned collard greens, purple patatas bravas and meaty asado mushrooms. 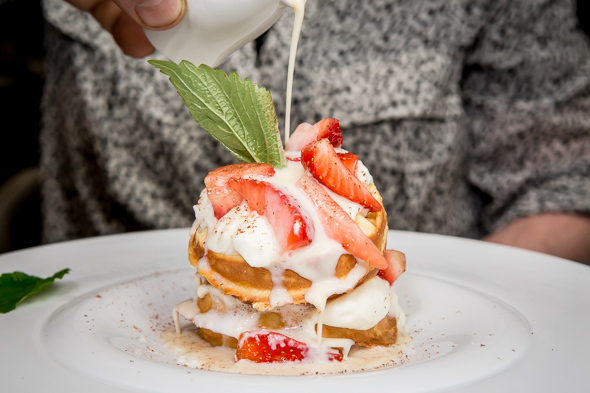 When it comes to dessert, there's a tres leche waffles ($11) featuring a stack of waffles with macerated cherries and tres leche poured table side. It ultimately tastes okay but for some reason arrives under a cloche which leads me to expect a puff of smoke or steam to be released when it's lifted but...there's nothing. It's just another example of style before substance - a common theme throughout this evening.